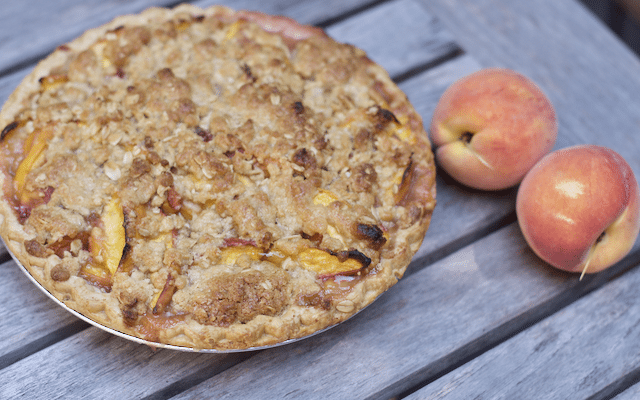 Our easy summer peach pie recipe is one that we come back to over and over again. It’s ideal for making when we get the chance to go peach picking, or when we see peaches on sale in the market. Fresh peaches make a wonderful easy pie that everyone loves with a scoop of vanilla ice cream! 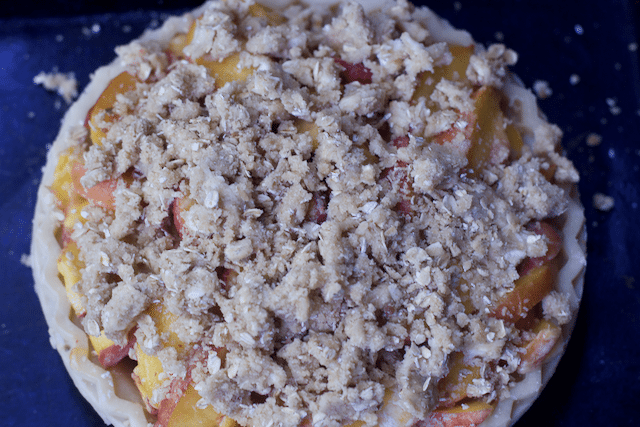 This easy peach pie recipe requires no peeling and uses a deliciously easy crumble topping. 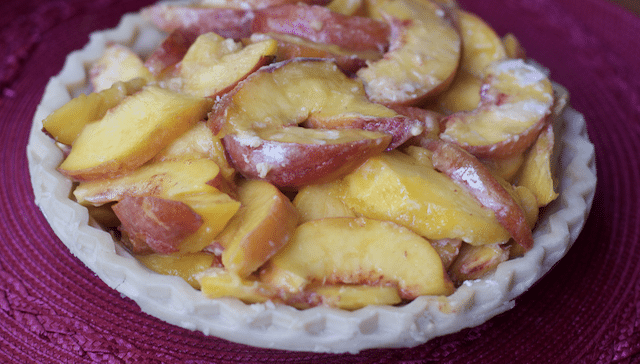 I am revisiting this peach pie recipe that I made in 2011 because we just went peach picking again this past week and although we could have eaten these sweet peaches fresh, I needed to remake this favorite pie recipe. I revisited this recipe also because it is so simple and the best part is that you don’t have to peel the peaches. Just slice them and add them to your crust. (store-bought for us). In an hour, you have a flavor of summer that will soon be gone. 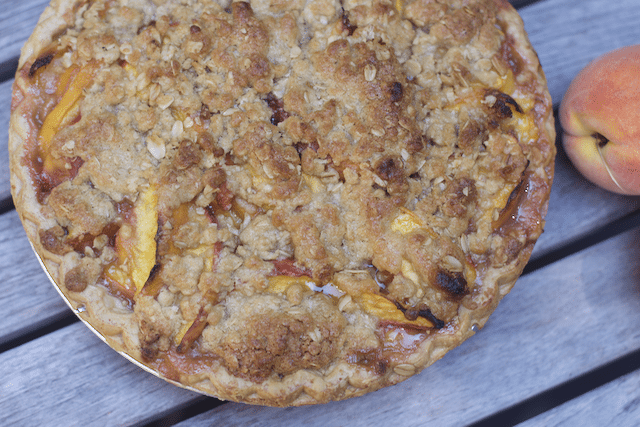 I love that this peach pie recipe has an oatmeal topping as well. Feels like you are getting a little nutrition from the fruit and oats! I even used whole wheat flour because I was all out of the other! Plus, it’s a healthier option than a second crust which is more popular on fruit pies usually. Use your clean hands or a pastry tool to make the crust. Kids can help with this step! You can use a pre-baked pie crust for a faster peach pie recipe, or cook your crust a bit before putting your filling in so the top doesn’t burn while making sure your crust is cooked through. Of course, no peach pie recipe is complete without a scoop of yummy vanilla ice cream on a warm or even room temperature pie. Kids love the chance to have extra ice cream on their dessert, and adults will enjoy that extra cream. If you find a local orchard that will let you come out and pick leftover peaches, you can find great deals on slightly bruised pieces of fruit. If you can manage this, then you’ll find you save tons of money and you can freeze or can the excess fruit for future pies, cakes, cookies, and treats. One of my favorite parts of peach picking is the fact that I can have delicious fruit for months at a low cost. 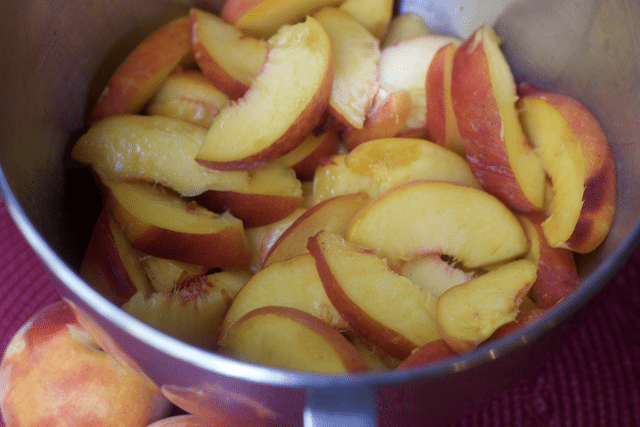 You can easily wash, slice, and freeze in vacuum storage bags and use the peaches up to six months down the road. If you are good at home canning, you can make your own homemade fruit pie filling. This easy summer peach pie recipe is a perfect choice for any weekend potluck with your friends and family. Fruit pies go great alongside your favorite grilled or barbecued meats, and of course, they are a little bit healthier than other desserts. 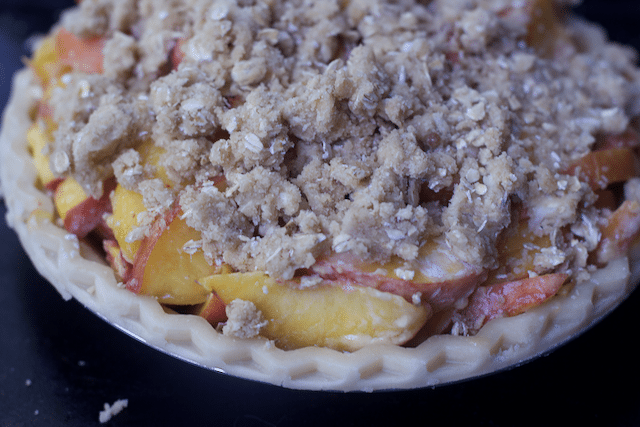 Transfer peach filling to pie shell, then sprinkle with crumb topping. Place pie on a rimmed baking sheet and bake until juices are bubbling and topping is golden brown, 1 hr to 1hr 15 mins. Let cool on a wire rack 1 1/2 hrs before serving. Store covered, at room temperature for up to 2 days. thanks so much, Hope you enjoy it. This is a truly delightful peach pie recipe, Maria! Amazing idea for a family gathering! The ice cream is a must Julie:) THanks hope you have a great weekend as well. Hi Maria, peach pie sounds so good and I bet it was yummy with the ice cream on top! I hope you are enjoying your weekend and this is the perfect weekend for it. Take care. I love fruit pies–much better then cakes or cupcakes!! I have not had peach pie in ages–now I am wanting a piece!! Thank u for kind words. It tasted pretty good too! I love this recipe. Simple, natural ingredients, and wonderful flavors and textures. Thanks for sharing it! 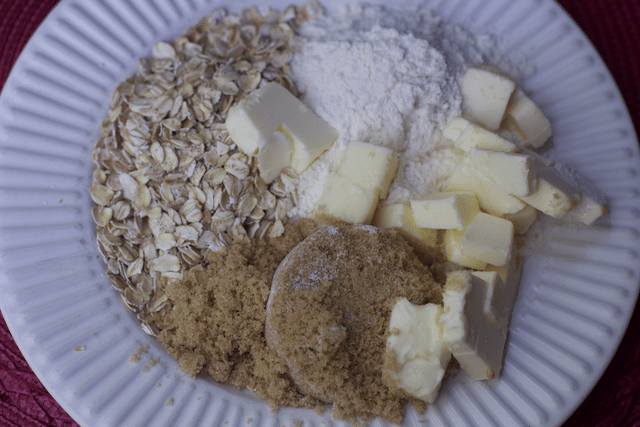 What wonderful pictures of your ingredients and pie. That alone makes me want to make it!! I love peach pie and cobblers. I will have to make this. YUMMY! Omg this looks and sounds so delicious! I wish I was a baker! !